The scientists of the Lobachevsky University and the Institute of Low Temperatures and Structural Research in Wroclaw (Poland) have conducted unique studies of oscillation properties using optical spectroscopy. 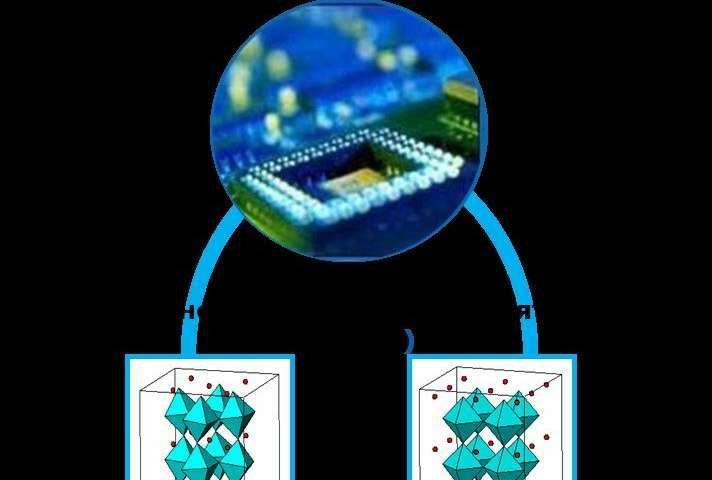 Bismuth-containing layered perovskites, first described by Aurivillius, have recently received research attention. Lobachevsky University scientists have obtained the main representatives of the family of Aurivillius phases: Bi2MoO6, Bi2WO6, Bi3NbTiO9, Bi4Ti3O12 and CaBi4Ti4O15. The Aurivillius phases are the main candidate materials for producing nonvolatile memory chips. Currently, existing random access memory types are volatile, i.e., the contents of the memory are erased when the power is turned off. Equipping computers with non-volatile memory is a long-term goal of computer science research. Such types of memory already exist, for example, the so-called FRAM (Ferroelectric Random Access Memory). The main element of the microchip is a thin film of ferroelectric. Ferroelectrics are substances that have spontaneous electric polarization in the absence of an external electric field in a certain temperature range. The scientific and practical interest in Aurivillius phases is based on the transition from the ferroelectric state to the paraelectric phase, which is accompanied by the disappearance of spontaneous polarization. The principle of operation of FRAM chips is based on polarization switching by an external electric field between the two phases: polar and nonpolar, while the memory cell stores 0 and 1, respectively. The information is recorded or read by switching the polarization of ferroelectric domains by an external electric field. Microchips may have to operate under extreme conditions, i.e. at high temperatures. Therefore, information on these compounds' thermal stability is required. Lobachevsky University scientists have studied the behavior of the compounds when heated and have determined the operating temperature range of the microchips' material. In addition, the temperature of the transition from the ferroelectric state to the paraelectric state was determined by the method of differential scanning calorimetry in conjunction with high-temperature X-ray diffraction. The dependence of the transition temperature on the composition and structure of the samples was revealed for a number of compounds. In the future, this will help to obtain samples with specified properties. Memory chips resistant to thermal effects can be used at chemical plants to control industrial processes (for example, under synthesis conditions) and in fire protection systems equipped with video recording systems. To estimate the changes in the linear dimensions of the substance upon heating, the thermal expansion of the Aurivillius phases was studied. According to Professor Alexander Knyazev, Dean of the UNN Faculty of Chemistry, the researchers found that an increase in the linear dimensions of the heated samples occurred primarily in the horizontal plane. "During the transition to the paraelectric state, the compounds' linear parameters increase more evenly throughout the bulk of the material. This information is important for predicting the behavior of the material under specified operating conditions," Alexander Knyazev notes. Jointly with their colleagues from the Institute of Low Temperatures and Structural Research in Wroclaw (Poland), UNN scientists have carried out unique studies of oscillation properties using modern methods of optical spectroscopy. The results of the study reveal a number of structural features characteristic only of the Aurivillius phases due to their layered structure. As a follow-up of this research, the Nizhny Novgorod team proceeds with the study of the Dion-Jacobson phases, which also belong to the class of layered perovskites. The researchers' interest in these compounds is due to the possibility of their use as ferroelectrics, dielectrics, piezoelectrics, superconductors and photocatalysts for water decomposition under the action of visible light. The use of the Dion-Jacobson phases as an initial reagent for the synthesis of other layered perovskites is also of great importance.